A large, healthy blueberry plant produces thousands of flower buds every year. With up to 16 individual flowers developing from each bud every flower a potential berry, pollination needs in blueberries are great. In order to set fruit, pollen that is produced by the flower’s anthers must reach the stigma so it can fertilize an ovule that will develop into a seed inside the flower’s ovary. There are dozens of these developing seeds inside each berry and nearly all of them must be fertilize” in order for the fruit to develop normally and reach its full size. Blueberry pollen is sticky and relatively heavy. It cannot move on its own and it is not easily blown around by the wind like pine pollen or corn pollen. Furthermore, the shape and position of blueberry flower parts effectively prevent the pollen from falling onto a receptive stigma — even in cultivars that are self-fertile. 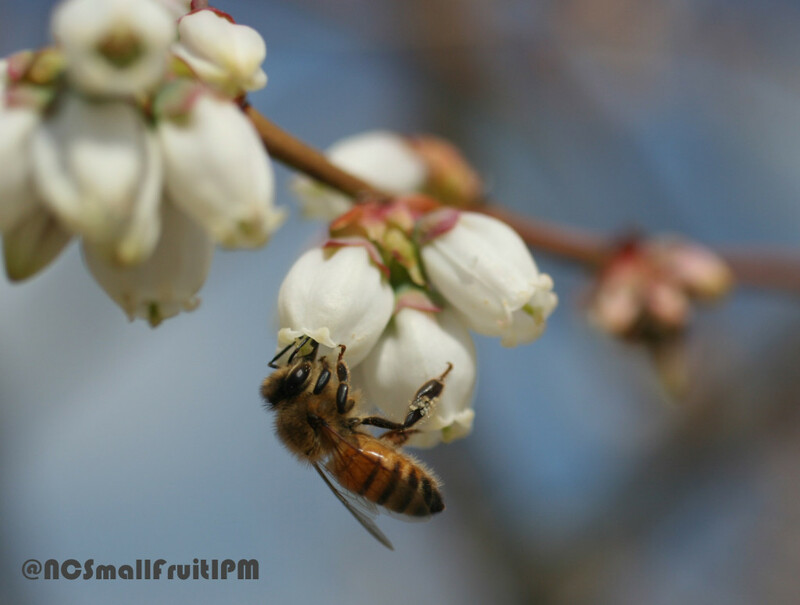 Therefore, in order to set fruit, the flowers of a blueberry plant must be pollinated by insects. Numerous native bees (including bumble bees and solitary bees) are indigenous pollinators of blueberry plants in North America. In addition, honey bees are used extensively by growers to augment populations of native pollinators. Bees are attracted to the flowers by odors and sweet nectar that is produced by glands near the base of the stigma. Both pollen and nectar serve as food for the bees and their offspring. As insects visit blueberry flowers, pollen adheres to their bodies and is carried with them as they move from flower to flower. When bees probe for nectar inside a flower, they brush against the stigma and unwittingly leave behind some of the pollen they are carrying. Some species of bees vibrate each flower with their flight muscles as they collect pollen. This buzzing activity (known as sonication) shakes pollen from the anthers so it is easy to collect, and also tends to increase pollination will occur. 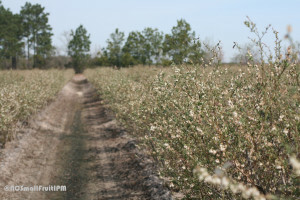 Honey bees are typically stocked in commerical blueberry fields at rates of one to four hives per acre and are typically the most abundant bee species in North Carolina blueberry fields for this reason. A single visit by a honey bee to a blueberry flower can result in relatively few seeds developing, but relatively high stocking rates can compesate to a degree for lower single visit pollination efficency. In addition to foraging for blueberry nectar and pollen through the opening at the apex of blueberry flowers, often referred to as “legitimate” foraging, honey bees may also take advantage of slits made by carpenter bees to feed on nectar. This type of foraging, termed “robbing” or “poaching”, does not contribute as much pollination to flowers as legitimate foraging, but it does result in some meaureable pollination. Observations in North Carolina blueberry fields also suggest that robbing honey bees may visit flowers more quickly that those foraging legitimately. It is possible that this may also allow honey bees to visit more flowers when robbing. As their name suggests, southeastern blueberry bees are very common native pollinators in blueberry fields. They superfically resemable worker bumble bees on the wing in size and markings, but male southeastern blueberry bees can distinguished by their yellow “face“. 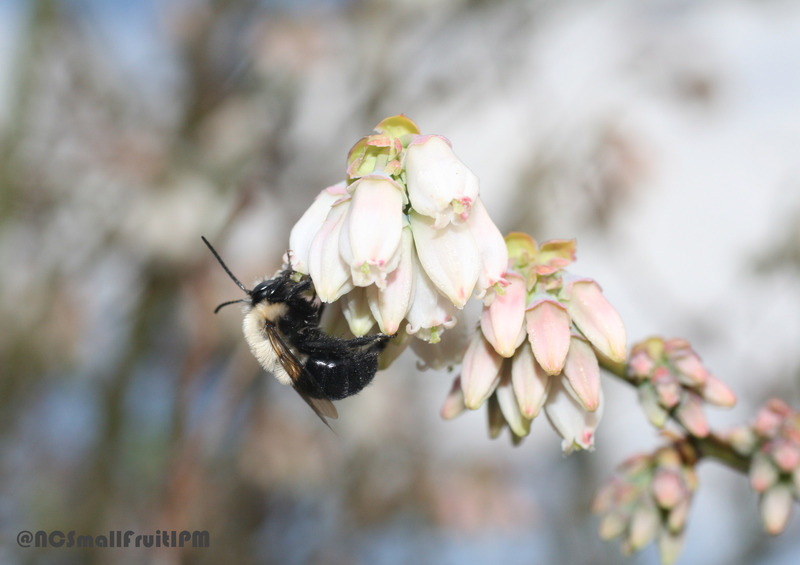 Some bumble bees may also have yellow bristles on their face, while the yellow patch on male southeastern blueberry bees is is not covered in bristles. Southeastern blueberry bees sonicate, or buzz pollinate, flowers, and when walking through a field with these bees present, their buzzing can help observers locate to track their movements. Southeastern blueberry bees appear adapted to forage on blueberries and other plants that flower in the early spring, such as Carolina jessamine, oaks, and red buds. 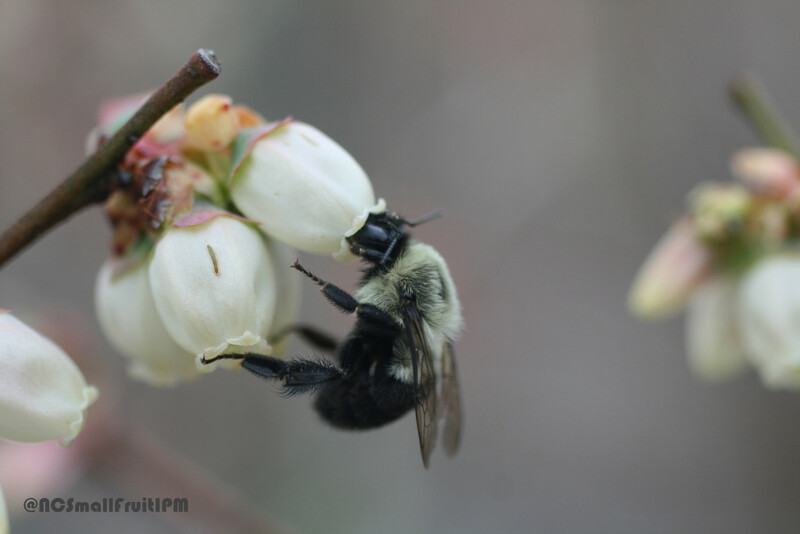 However a single visit by southeastern blueberry bees to a blueberry flower was observed to result in fewer seeds developing than single visits by bumble bees and other small native bees. 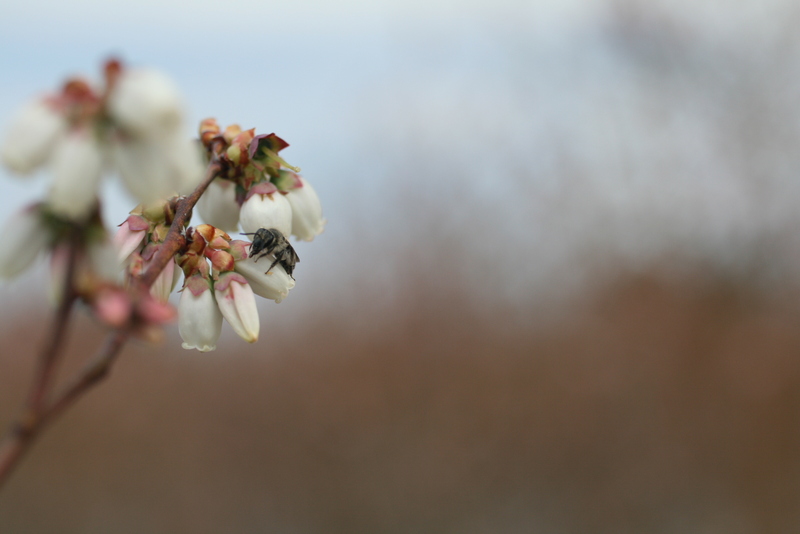 This suggests that while they may specialize on blueberry flowers, southeastern blueberry bees may not be the most efficient pollinator with respect to single visit efficency. 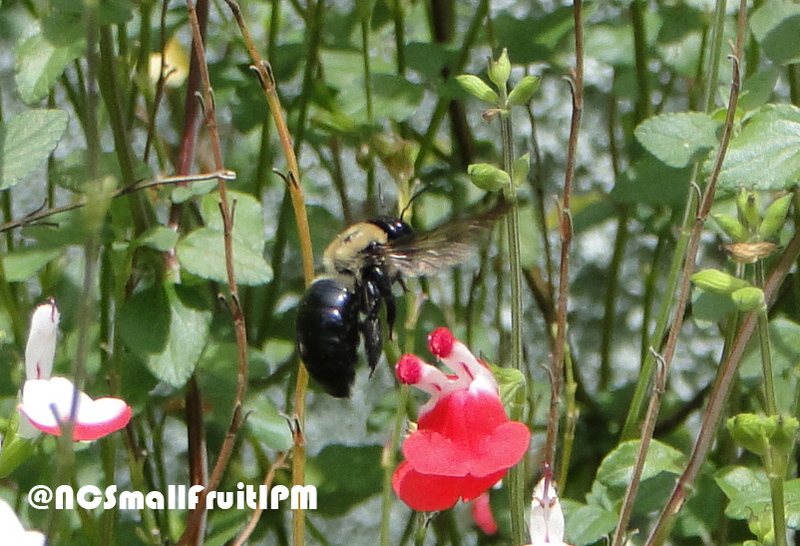 Bumble bees in North Carolina blueberry fields may include native species, such as B. bimaculatus, or the artifically stocked species B. impatiens. 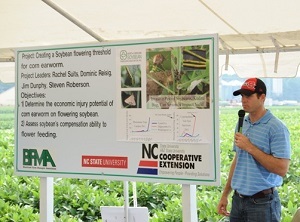 The latter is more common in North Carolina blueberry fields, as some growers will purchase bumble bee “quads” to suppliment honey bee hives. Bumble bee quads can be used for a single season in North Carolina. Bumble bees may be active in weather conditions in which honey bees are less active and also produce more seeds in a single visit on average than honey bees. Bumble bees sonicate flowers, which may contribute to their pollination efficency. Many species native of bees can difficult to distinguish on the wing, and some groups are even challenging for experts to identify. The most common small native bee observed in North Carolina blueberry fields is Bradley’s andrena (Andrena bradleyi). Bradley’s andrena (Andrena bradleyi) are the most common “small native” bees found foraging in blueberries. As a group, visits by these small native bees have been observed to results in the higher seed set in blueberries than single visits by honey bees or carpenter bees. Bradley’s andrena females can be distinguished from other small native bees in blueberries by their relatively long “face”, which can be seen in the photo above (click to enlarge). Males have a yellow patch on their “face”. Xylocopa virginia is the most common carpenter bee found in North Carolina blueberries. They can be distinguished from bumble bees by their hairless abdomen. Males have a yellow patch on their “face”, while female faces are all black. The eyes of both sexes may appear green. Carpenter bees often “rob” flowers with narrow corollas by creating slits near the base to access floral nectaries. In blueberries, these slits can then be utilized by other bees, which may decrease the amount of pollen that bees can deposit on flower stigmas. Nectar robbing has been demonstrated to contribute some pollination to blueberries, but it is a less efficient means of pollination than visits through the floral opening. Orchard bees (Osmia cornifrons) – coming soon! Brewer, J.W. and R.C. Dobson. 1969. Pollen analysis of two highbush blueberry varieties Vaccinium corymbosum. Journal of the American Society for Horticultual Science. 94:251-252. Cane, J.H. and J.A. Payne. 1988. 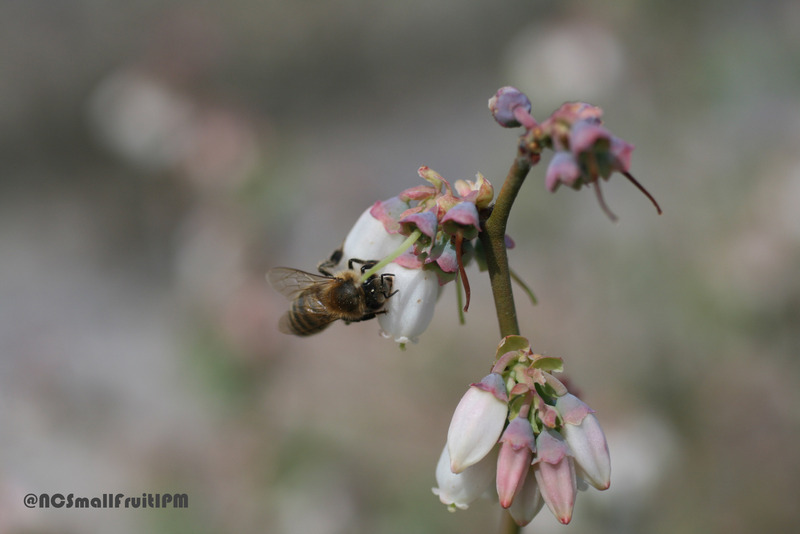 Foraging ecology of the bee Habropoda laboriosa (Hymenoptera: Anthophoridae), an oligolege of blueberries (Ericaceae: Vaccinium) in the southeastern United States. Annals of the Entomologial Society of America. 81:419-427. Sampson, B.J., R.G. Danka, and S.J. Stringer. 2004. Nectar robbery by bees Xylocopa virginica and Apis mellifera contributes to the pollination of rabbiteye blueberry. Journal of Economic Entomology. 97:735-740. Rogers, S.R., D.R. Tarpy, H.J. Burrack. 2013. 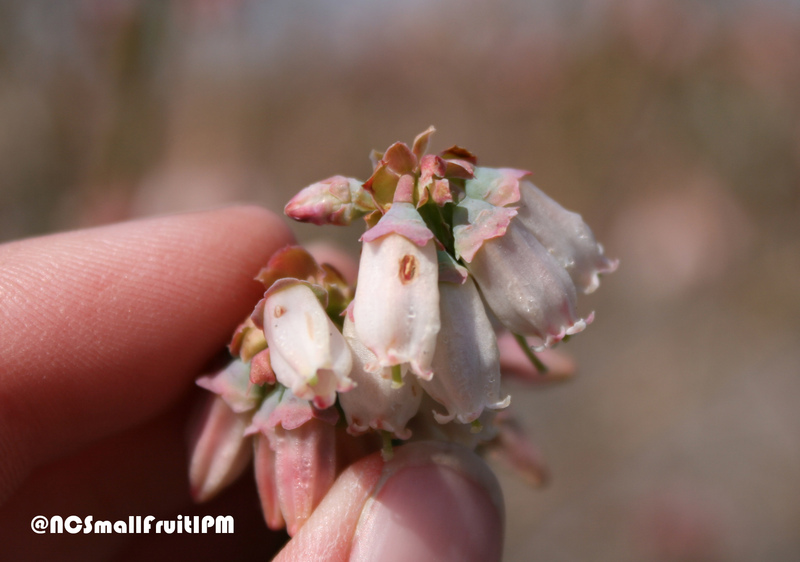 Muliple criteria for evaluating pollinator performance in highbush blueberry. Environmental Entomology. 42: 1201-1209.